The impact of every play is amplified in overtime, even punts. 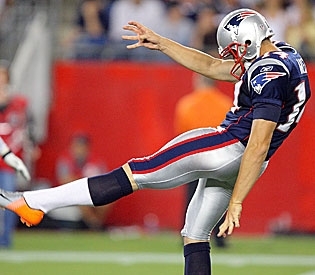 During the Patriots OT struggle with the Ravens last Sunday, punter Zoltan Mesko may have made the punt of the year. Facing a 4th and 6 from their own 16, Mekso was called in try to bail out the Patriots. Typically, punts from that region of the field net about 39 yards, putting the Ravens at their own 45, and it looked like the Ravens were going to win the field position battle. From there, it only takes one or two first downs to move into striking distance for a game winning FG attempt. When Mesko trotted onto the field, the Patriots' win probability (WP) was 0.33. Mesko’s punt went for 65 yards, aided by wind and by poor fielding by the Ravens returner. When the ball came to rest on the Baltimore 19 yard line, the Patriots had gained the upper hand with a 0.54 WP. The punt was worth +0.21 Win Probability Added (WPA), an impact extremely rare for a punt that neither results in a long return nor a fumble. On a side note, I noticed that in more than one of the write-ups of the punt, it was described as a big turn-around moment for Mesko. One article noted that he had been struggling, ranked only 24th in the league in net punt distance. This is silly. Mesko plays on a team with a very good offense, so his punts are going to tend to be from near midfield or better. Those kinds of punts are almost always shorter than punts from deeper in a team’s own territory due to the short field. Rankings punters by net distance without considering where he’s punting from is nearly meaningless. shoot for the "coffin corner". I'm quite certain that this stat is better than average punting distance. How about a post comparing other metrics for punter effectiveness? Maybe average WPA per punt, or average yards from point of impact to the opponents goal line. Or a "average yards from target" metric that takes the target as the goal line on punts less than, say, 60 yards and 60 yards as the target for longer punts. Could you rank punters by their average WPA-per-punt, or perhaps by valuing the change in field position as points using Romer's methodology for assigning point value? No mention of the flip side? Tom Masthay's 37 yard punt in OT from Green Bay's own 15 allowed the Dolphins to start at their own 48. Two first downs later they kicked a 44 yard field goal to win. It looks like it wasn't devastating according to WP, but he sure didn't help his team. And I agree 100% that gross/net yards is not, in and of itself, a particularly useful stat. I'd love to see something like % of goalline distance as a stat. It would be interesting to see the Punters(and kick coverages) ranked by Yards over Expected Net Yards (considering the region of the field). Actually similar study for running backs would be interesting. With consideration for down and distance. WPA and EPA are great tools but the effect of playcalling is huge. "The pro football abtract has a stat called adjusted punting yards that adds 10 yards for each Inside 20 and subtracts 20 yards for each touchback"
The "inside 20" stat for punters is way too generous; it should be changed to "inside 10" or so. The "adjusted punting yards" is a kludge--why the 20 yard line? Why 10 yards added? How were these parameters arrived at? The beauty of metrics like EPA or WPA (in general, not just for punts) is that there really aren't any "free parameters" that need to be picked out of thin air. And in principle they automatically adjust for all the situational factors without ad hoc tuning. Keep in mind all that stuff ranks punt teams and not necessarily the punter alone. EPA and WPA would be what would be best, but they're a little abstract and context-sensitive. Maybe "yards above expected" would be more digestible. Is there video of this punt? FWIW, Mesko has been fairly inconsistent this year, mishitting a number of punts. He's had good fortune in that his mishits are such suprises that they often roll dead rather than getting returned, but it is not inaccurate to say he has struggled. only two of Mesko's 16 punts have been from the opponent's side of the field, and thus net yards is, in this case, a good indicator of his mixed effectiveness.